Common in terms of survivors, yet overdates always have higher demand than other varieties. Available in all grades, and problem free examples can be had if one is willing to spend the money. There is an MS66 out there as finest, with a decent grouping of MS and AU examples as well. NGC Graded XF45. Totally original coin with only a few distracting marks. May be the definition of "Barn Find". Variety Attribution: Obverse-11 over 10. Stars are large, usually flat on the left and sharp on the right. Mouth well open to full depth. Date is 9 1/4 mm. There is a bold die dot between 8.1 at bottom and a much smaller dot between 11 near top and a bit closer to the left 1. A fine vertical curved line is to the right of the last 1. A spike is upward from the top front of cap. Some specimens show a fine die crack joining stars 9 through 12. Reverse-50. C. is 2 1/4 mm. Arrow to A is 1/2 mm. A solid double segment above last S in STATES. Center dot between crossbars 4 and 5. 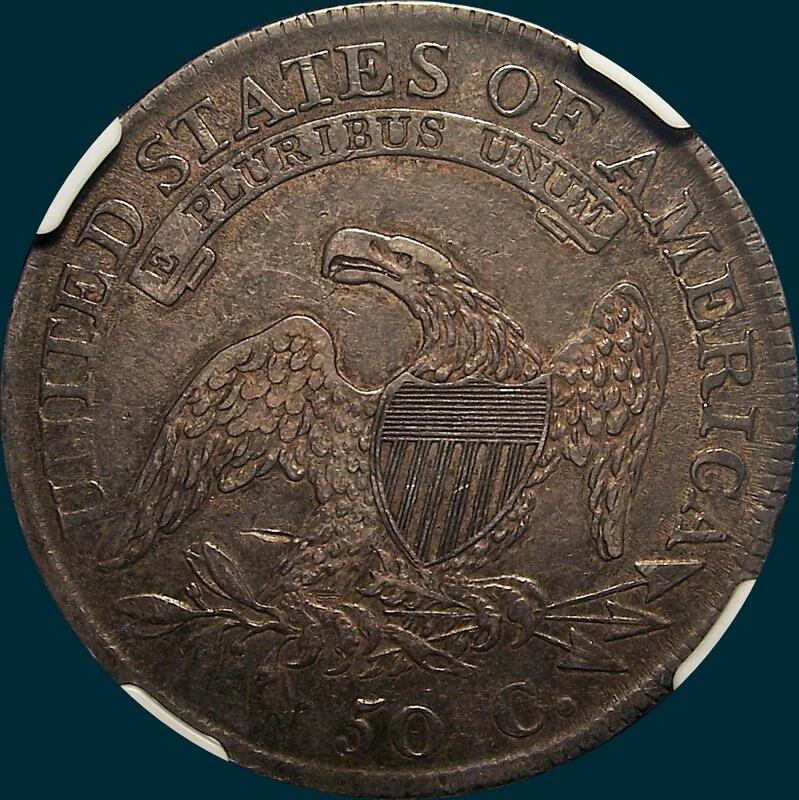 According to Edgar Souders, he estimates that the projected mintage figure for this overdate is approximately 185,176. Get his book Bust Half Fever and read all about Overdates and how he came up with the number! This number does include both the O-101 and O-102 marriages. 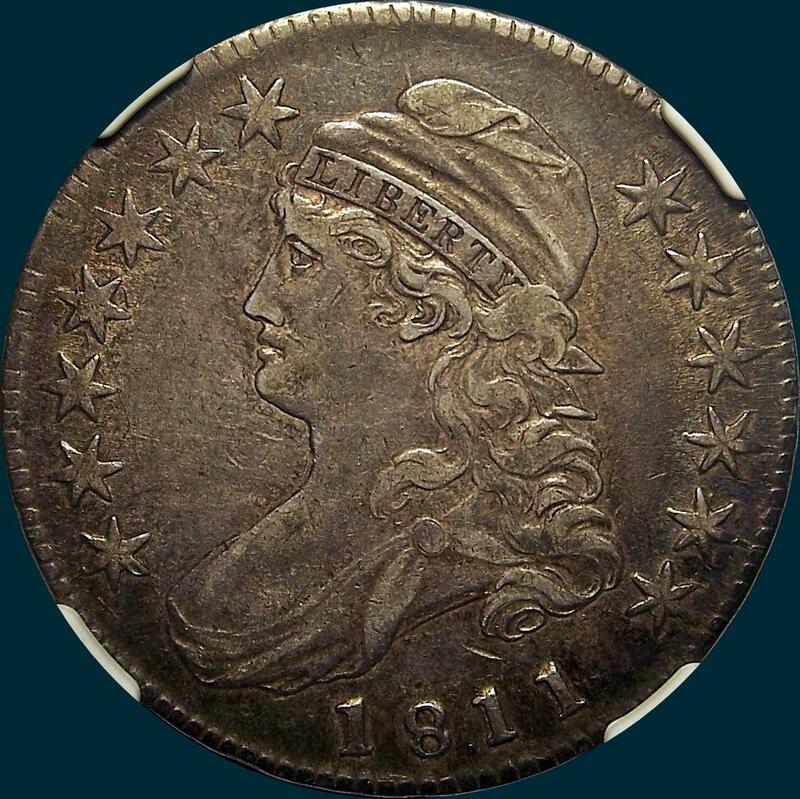 This overdate may not have been the result of the use of a left over 1810 die, but may have been an engraver error and the engraver after realizing his mistake, lapping off (removing) the incorrectly punched 1810 and replacing it with 1811.